We once spent an unforgettable Bank Holiday weekend touring The Netherlands. Even though the weather did not cooperate on this trip, it still stands out as one of my most memorable holidays. It poured the kind of “sideways” rain that requires you to ditch your umbrella in the bin and purchase a new one every block or so. We were fortunate enough to get a few breaks from the downpours and even enjoyed a few quick appearances from the sun. The fact that The Netherlands still remains one of my all time favorite holidays just goes to show how many amazing sites this country has to offer its tourists. Here are a few of my favorite attractions. Keukenhof is often referred to as the Garden of Europe as it is one of the world’s largest flower gardens. Its stunning displays showcase a variety of flowers and you’ll see tulips in every imaginable color as far as the eye can see. Tulips have always been my favorite flower. I’d take a bouquet of tulips over roses any day which is something considering I was born on Valentine’s Day. The park covers 79 acres and is located southwest of Amsterdam in a town called Lisse. The gardens are located on what was once a hunting ground dating back to the 15th century. You can tour the gardens from mid-March to mid-May but the best time to view the tulips is in the middle of April. The Anne Frank Museum is located on a canal in central Amsterdam and is one of the most memorable and moving museums to visit in the world. During World War II, Anne Frank hid from the Nazis with her family and 4 others in the hidden rooms in the back of this canal house. It was known as the Secret Annex. Though Anne Frank did not survive the Holocaust her story did through her well known diary, published in 1947. The Museum has preserved the hiding place in this 17th century building. Visitors can tour the exhibition and learn more about the life of Anne Frank. Delft pottery is easily recognizable by its beautiful blue hand painted designs. On a visit to Royal Delft you can witness artists still delicately hand painting each piece by this centuries old tradition. Royal Delft is located in the town of Delft and is the last remaining earthenware factory from the 17th century. Be sure to stop by the gift shop to purchase a hand painted piece of pottery made just steps away in the factory. My Delft pottery piece is one of my favorite souvenirs that I’ve collected over the years. 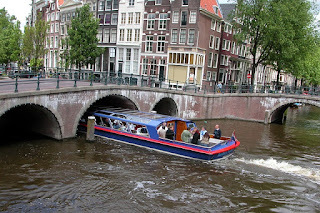 No trip to The Netherlands is complete without a canal tour through one of the world’s most amazing cities, Amsterdam. There are many variations of canal tours to choose from offering wine and cheese, burgers and beer, champaign or just your regular sightseeing tour. Whichever tour you choose you will experience beautiful views of the waterfronts as you glide through this majestic city. 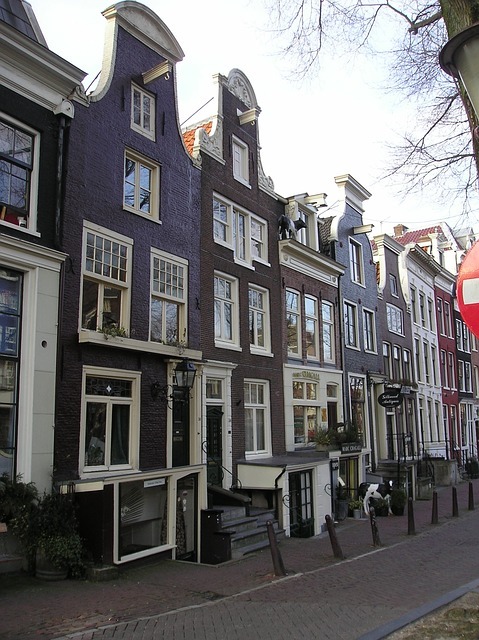 The Netherlands is just one of the 70 countries in which International Vacation Home Exchange offers properties. View this Amsterdam apartment in city center or view this exclusive vacation home located in one of the most picturesque locations in The Netherlands. Add a home swap in The Netherlands to your bucket list and know that rain or shine you’ll have holiday memories to last a lifetime. My grandmother collected Royal Blue Delft pieces and I have happy memories of it throughout her kitchen. Amsterdam is a wonderful place to visit--I would like to get back there one day. 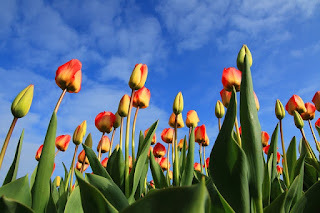 Great blog Lisa as while I'm reading it I can imagine myself playing in the Tulip field and taking tons of photos! I’d Love to Travel But….